Would you still support a Brexit if Britain leaving the European Union (EU) meant Scotland leaving the UK? 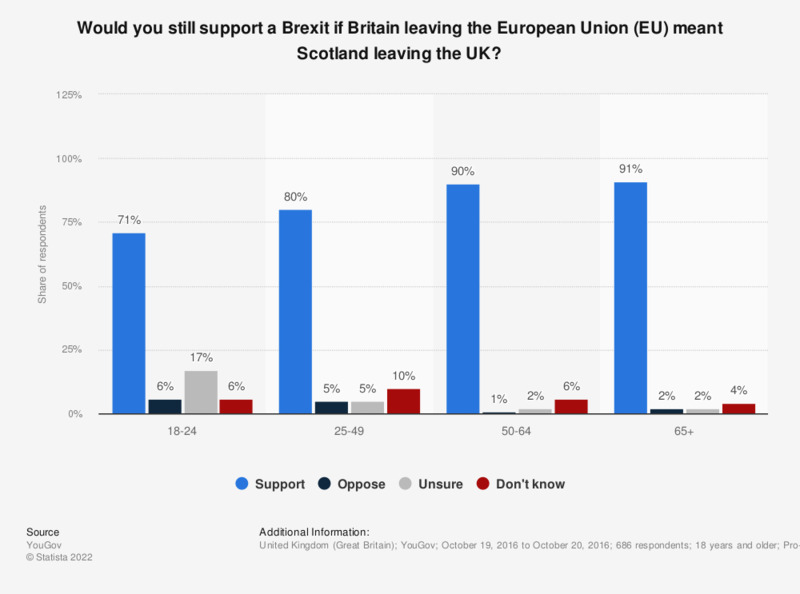 This chart shows results from an online survey conducted in Great Britain in 2016 on whether Brexit supporters would still be in favor of Brexit if Scotland left the UK as a consequence, by age group. The strongest support was found in the older age groups, in which more than 90 percent of respondents still insisted on Brexit under the given circumstances. * People who responded "Right to leave" to the question "In hindsight, do you think Britain was right or wrong to vote to leave the European Union?" Source question: There will probably be several years of planning and negotiation before Britain leaves the EU. If the following things happened between now and Britain leaving the EU, how would it affect your views? - If Britain leaving the EU will mean Scotland leaving the UK? Would you still support a Brexit if Britain leaving the EU will mean Scotland leaving the UK? Would you still support a Brexit if Britain leaving the European Union (EU) meant Scotland leaving the United Kingdom (UK)? Would you still support a Brexit if Britain leaving the EU will mean a significant increase in unemployment here in Britain? Would you still support a Brexit if Britain leaving the EU will mean the price of a weekly grocery shop going up by 10 percent? Would you still support a Brexit if Britain leaving the EU will mean much of London's financial services industry moving to other EU countries? Do you think leaving the European Union (EU) will make it more or less likely that Scotland will leave the United Kingdom (UK) in 2016? Would you still support a Brexit if Britain leaving the EU meant the rest of the EU putting up tariffs against British exports? Do you think leaving the EU will make it more or less likely that Scotland will leave the UK?